FC30 in the Hyperflow of History. Success often carries with it the seeds of its own destruction, and that was certainly the case with the Roman republic by the late second century B.C.E. "Superpower" status wrought far-reaching changes affecting all levels of Roman society. Unfortunately, the conservative Romans had great difficulty adapting to such rapid changes. The result was a century of political and social turmoil during which Rome kept trying to patch up these new problems with the same old solutions. Fortunately for Rome, it was still dynamic and energetic enough to survive and even expand during this period of social decay and political and military turbulence. Rome faced serious problems in three areas: the fate of its peasants, the government of its provinces, and its army. 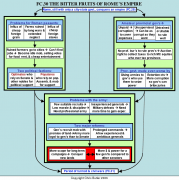 For Rome's peasants, the fruits of empire were bitter indeed. The Second Punic War against Hannibal had devastated many fields in Italy. The other wars of the third and second centuries B.C.E. had left many fields ruined by years of neglect while the farmers were off campaigning. When the farmers came home, two things came with them. First of all, thousands of prisoners of war flooded Roman slave markets. This influx of cheap slave labor let rich Roman senators set up huge estates that competed with the free peasants already struggling to revive their farms. Added to this was an influx of cheap grain from Sicily (also from estates worked by slaves). Faced with such competition, thousands of peasants lost their farms and migrated to the cities, especially Rome. Life in the cities was little better. Slaves there had also taken many of the jobs the peasants might have hoped for. Thus the dispossessed peasants became an idle urban mob dependant on various politicians for food and rent in return for political support. This led to untold squalor and the occasional cheap spectacles of gladiatorial fights and chariot racing, the proverbial "bread and circuses" of ancient Rome. Because of this, Roman politics became corrupt, violent, and split into two factions, the Optimates who drew their support from the Senate and other nobles, and the Populares who relied on the Tribal assembly and mob for support. Provincial government was no better. The root of the problem was that Rome was trying to rule a large empire with an amateur city-state government. At first, extra praetors (judges), and later pro-consuls (ex-consuls) and pro-praetors (ex-praetors) were created to run the provinces for terms of one year. However, one year was not nearly enough time to learn about a foreign culture and how to govern it. Therefore, such governors were untrained, unsupervised, and unpaid. Being unpaid forced them to cover their expenses through corruption. Being unsupervised let them get away with almost anything they wanted. Being untrained meant they were usually incompetent. Even the creation of permanent extortion courts to try corrupt ex-governors only encouraged more corruption so they could bribe the jurors who were also their senatorial colleagues who hoped for similar leniency in the future when they were tried for corruption. In addition there were no professional Roman bureaucrats to run the daily machinery of provincial government. Instead, governors brought personal friends and slaves. Tax collection was done through tax farming, a system where rich businessmen, known as equites, bought the right to collect the taxes of a province, paying the state the agreed sum and then over-taxing the provinces to cover their expenses and more. These problems with dispossessed peasants and corrupt provincial government led to two problems with the army. For one thing, Rome’s army of peasant militia had been fine when Rome’s wars were close by and campaigns ended in time for harvest. However, long terms of service in overseas wars had ruined many farms through neglect, leaving fewer recruits able and willing to go to war, lowering the army's morale and efficiency. Second, the yearly turnover of governors led to inexperienced generals who suffered frequent military defeats. This led to two reforms. First, generals created a long-term professional army by recruiting the dispossessed peasants, promising them land after the war as an inducement to enlist. They also had to supply them with their equipment since the Senate still felt only those who could afford to equip themselves should serve in the army. Therefore, the soldiers were more loyal to their generals than to the state (probably seeing little distinction between the two). The second reform was to extend the terms of provincial governors from one year to as many as five. This resulted in a few experienced, ambitious and rival generals. These reforms triggered a vicious cycle where those few governors with armies had more scope for long-term campaigns and outright conquest of new lands. This upset the balance of power in the Roman Senate, between a small number of rich and powerful men and the majority of senators who had few opportunities for glory and riches. The combination of all these social, economic, administrative, and military problems bred a century of political turmoil, administrative unrest, and civil wars between rival generals.